Ever dreamed of staying in a cave room? 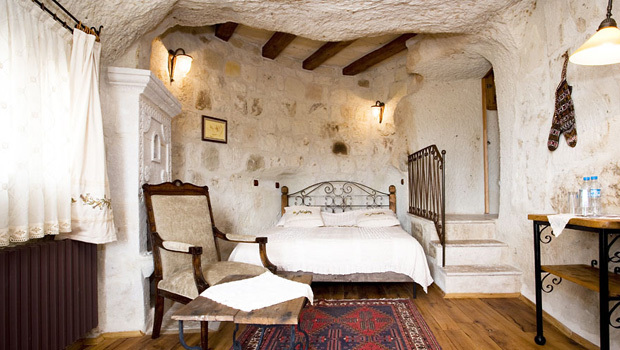 Junior suite at the Kelebek Cave Hotel in the heart of Goreme's historic old village in Cappadocia. When you travel to Turkey, Fairy Chimneys Travel ensure that where you sleep is just as memorable as what you see. Luxuriate in a lavish cave hotel, carved from ancient rock by the hands of the Byzantines. Breathe in the sea‐salty Mediterranean air, as you sink into the pillows of a charming pension in a small Turkish village. Feast on fresh local honey, eggs and produce in a fully‐stocked gourmet kitchen in a stone and timber country style hotel at the foot of Mount Ida. Visit Istanbul and stay in an ancient neo‐Ottoman palace fit for a king, overlooking the straits of Bosphorus. No matter what your budget is, Fairy Chimneys Travel will find you the most authentic, unique and exclusive place to rest each day. You’ll always be in the heart of the real Turkey, with access to the best local taverns, restaurants, shops and sites. Whether you prefer an intimate B&B, a boutique hotel or a luxury mansion, Fairy Chimneys Travel has the insider knowledge to match the best hotels with your Turkey tour. Contact us now to let you in on Turkey’s best kept hotel secrets.